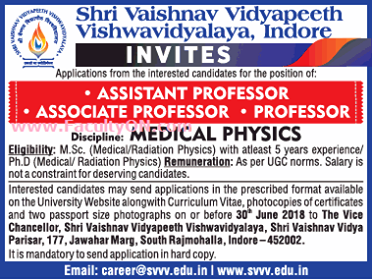 Shri Vaishnav Vidyapeeth Vishwavidyalaya, Indore has advertised in The Times of India newspaper for the recruitment of Professor/Associate Professor/Assistant Professor jobs vacancies. Interested and eligible job aspirants are requested to apply within 30th June 2018. Check out further more details below. About College: Shri Vaishnav Vidyapeeth Vishwavidyalaya is a private university established under Madhya Pradesh Niji Vishwavidyalaya ( Sthapana Avam Sanchalan) Adhiniyam in 2015 at Indore MP(India). The University has been established with a vision to be leader in shaping better future for mankind through quality education, training and research. It shall pursue the mission to make a difference in sustaining the growth of global societies by developing socially responsible citizens. Value based education being at the helm, the University shall promote endurance, excellence, fairness, honesty and transparency as its core values. How to Apply: The application duly filled in the prescribed form with CV and passport size photograph must reach the following address on or before 30th June 2018.